Well what a superb day we have had today on the LEJOG Tour. The excitement mounted throughout the morning in anticipation of our lunch time visit to Dr Moulton; the designer of the Hydrolastic Suspension. We eagerly arrived at 12.30pm and parked our cars in front of Dr Moulton's residence in orderly fashion. A total of 13 x 1100/1300s greeted him when he appeared at the front door and it was obvious to see his delight to see 'his' Hydrolastic suspension still serving our cars so well after 50 years and is testimony to his engineering ingenuity. He joined us for a group photograph and Claude Thomas' MG Mk1 1100 got Dr Moulton's eye where he proudly stood for a photo-shoot! He still has a keen eye for engineering detail and was quick to observe and point out that Stefan Michalak's Austin 1300 was at the incorrect Hydrolastic suspension height..........a priceless moment from the Genius Dr Moulton and shame on Stefan for not paying attention to his ride height!!! An absolutely priceless moment!! A token of our appreciation was given to Dr Moulton for hosting us where he was presented with a 'exclusive' LEJOG Poloshirt and Rally Board. We had the great privilege of being invited into his private study where book signing was the order of the day. A very valuable and privileged moment for each one of us who were in his company. Finally Alexander Boucke took us to the Hydrolastic Suspension museum and gave a fantastic informative talk on the Hydrolastic and Hydragas Suspension design and units. A deep hearted thank you goes out to Alexander who is the obvious apprentice to Dr Moulton. Our second visit was to Kimber House in Abingdon where we received an extremely warm welcome from the MG team plus with the added bonus of much needed refreshments which was gratefully received! A very interesting tour and the history of Kimber House was provided and we certainly felt very much at home with like minded classic car enthusiasts. The tour was fascinating and certainly a place to return in the future. A huge thanks to Chris Seward and the team and a visit which will be fondly remembered and a location noted for future gatherings and meetings! Thanks to all at Kimber house for being such excellent hosts and educating us further on the MG brand....it was a great visit. A leisurely start was had this morning with some sightseeing in the beautiful town of Bradford on Avon and some minor running repairs for Paul and Teressa Vincent's Austin 1300 and Dominiques Renaudin's VDP. Teressa's Austin had its rear metal fuel pipe repaired thanks to a local Garage who also provided the tea (thanks to Ian Ford at G&I motor services). Olivier Renaudin set to work fixing the rattling heat shield on the VDP exhaust pipe with a couple of steel bands where the welds had worked free; Dean Oakey assisted with re-torquing of the Cylinder head on the same VDP where the head gasket had started to weep. Oh and we mustn't forget that Ian and Dawn Kennedy have reported that their Morris 1300 has a blown rear number plate lamp!!!!! Our re-restart from Kimber house gave all the chance to inspect under Jose Ambel's bonnet when his Innocenti failed to start. A failed starter motor was the culprit and even worse it was a metro engine which explains a lot! A push start soon got him on his way and all we can say is had it been the original A series engine it would have never happened. Still a gorgeous car and one everyone wants to drive or push! 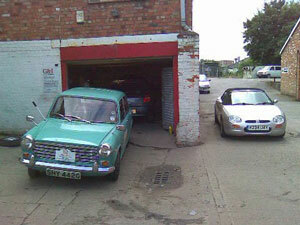 A quick search for a parts garage tomorrow morning in Longbridge beckons. All in all a fairly casualty free day, long may it continue! Again thanks to everyone for their support and a safe journey to all our LEJOG participants tomorrow for the mammoth 300 mile journey from Longbridge to Glasgow!! !